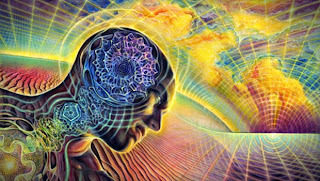 One of the Great Disadvantages of Intellect and Knowledge and, so to speak, our current Science – is the Role Assumption Plays and Guide the Consciousness into Forming Theories, which then are Given Impetus over Actual Reality. In this, the Mind Platform can In Fact be called an “Assumption Platform”. You have All Seen the Illusion Created by a Black and White Board of Squares or Circles, these things make their rounds on the Internet: the Mind Platform looks like these Black and White Squared / Dotted Backgrounds - similar to the Pixilation of Television. This will be in detail discussed in the Quantum Mind Studies. But, as a reference – the faster a Picture Move, the Greater the Assumption, because the Mind will take the Image and at Quantum Speed - Search for similar images in the Memory System, form a relationship with that and present a Theory as Assumption. And the Person will sound ‘Knowledgeable’, because the Minds Listening as the Audience will jump to a Similar Conclusion through Assumption, because – the Memory System will be similar, and the Mind Platform is Designed Similarly. Not all the same, but in ‘Groups’, meaning – you’ll have different Mind Platforms for different groups, to Create the Illusion of Individuality. Now, Imagine the Problem that Exist, where the Platform is Infused with Religious Doctrine throughout Childhood, and all the Conclusions that the Mind will Jump to when giving Value to Experiences where the Person would Regard the Experience as ‘Evidence’ that their ‘Knowledge’ is in fact ‘True’. And Obviously, these Experiences will be Repeated, because – the Mind will Search out, That which the Individual Seek to Prove to itself. And so, Falling in the Trap of the ‘Assumption God’, becomes a very simple thing as Evidenced by multiple groups on Earth with Very Diverse Views, all Claiming to have Evidence and Experience “that their Version of God, is the True God”. The Role the Secret Mind plays in this, as Secret Thoughts people have that remain Unspoken – is Massive, and plays a Fundamental Role in How Society Functions, and how Fears and Conspiracies, Faiths and Beliefs Develop and Form Groups that Support each-other in their Convictions. If you Study the Evidence and the Experience they Present, you will find that it is extremely Flimsy and you cannot Outright, Immediately Experience it. As an example: there are, for instance Meditation Programmes Presented that Teach you in detail how to apparently leave your body. The Prospect would then Follow the Instructions, and if their Mind Platform make them Susceptible to the particular Design of the Meditation Teacher’s Mind: they will End-up with an Experience of ‘leaving the Body’. While, in fact they have Created Mind Dimensions - with the Instructions they have Constructed the Energetic Charges and they have Created the Experience, Accordingly. The fact that they ‘Experience’ it as ‘Evidence’, as it is similar to the Instruction – is simply because the Instruction was the Programmed-Experience that, through Dedicated Obsession, would become ‘Real’. So, these things are quite Dangerous as they Mislead people Extensively. In the Primary Design of Religion on Earth, you would have a Mind Platform that will be Aligned to particular Teachers, Masters and Gurus. And the Person will Align to those that Resonate with their Inner Intuition, as they call it. But, in fact – it is the Mind Platform. They may be Lucky enough that the Creator Gods created several Layered Assumption Mind Platforms, so that you will Move in your Lifetime – from one Master to the next, ‘till Eventually you will Create yourself in the Image and Likeness of a Master, as your Final Assumption Platform would Present to you the Question and Answer that you are in fact a Master as well, with a Unique Message that you must Share, and that the Evidence will be, that: you will Accumulate Followers to Show that your Mastership is True. Without Realising, that your Followers simply have Mind Platforms Aligned to yours. In All of this, the Participants in these Mind-Platforms and the Religious/ Spiritual Faiths that form from it: are Purely Reacting, to their Programmed Design, with No Real Knowledge about how these Mechanics/Mechanisms actually Function, which makes for Perfect Enslavement. And make it Very Difficult to assist anyone to any form of Actual, Real, Life Realisation or Consideration to be Formed for Other Life, in Form, that Exist and Co-exist in the Cycle of Life. You can thus Identify those Following the Assumption God Mind-Platform, with Great Ease. And you will even have Different Members of a Family Following Different Assumption Gods. You’ll also Notice the Difficulty you’ll have to Communicate with them about Anything, as they would Always jump to Conclusions and Assumptions that suit their Knowledge base, their Memory base – as Reflected through the Mind Assumption Platform. To Solve this Problem, will take Meticulous Study and Extensive Self Forgiveness and Self Honesty to Disengage That which was Preprogrammed before Birth. Join Desteni Lite, which is a Free Online Course to start your Process to your Actual Eventual Freedom. Study All the material and do not Jump to Conclusions, or make Assumptions. We Note many people, would only read very little of the Material or listen to only Part of a Video and then Jump to a Conclusion and Assumption, and present themselves as ‘some Highly Intelligent, Enlightened Consciousness’. Please Note, we know who you really are – AS your Preprogrammed Robotic Design. And therefore, if you are not yet able to Overcome your Most Basic Thought Compulsions, we will Ignore you to Remain in your Bliss. As, in Time – you will face the Effect of your Illusion in your World. And may or may Not Decide it is Time to Get Real.